11 Days Cairo, Nile Cruise & Hurghada by Sleeper Train start to booking your tour to Egypt with 11 days visit cairo and pyramids and Egyptian museum and then take sleeping train going to nile cruise tour between luxor and Aswan and Hurghada more enjoying on the red sea tour. 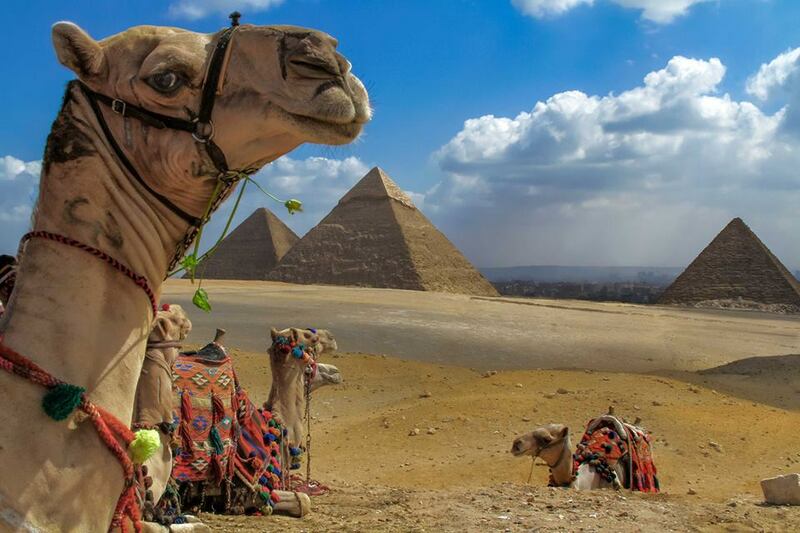 When Arrival to Cairo airport, Upon you arrival you will find our representative waiting you with the sign of Egypttravelcc tours, then you will be transferred by A/C car to your hotel. Overnight in Cairo. Transfer to the train station for your overnight Sleeper train to Aswan. Dinner on the train. Overnight Sleeper train. Breakfast on the train. Arrival Aswan and transfer visit The High Dam and The Philae temple. Transfer to the Cruise. Boarding before lunch, Embarkation. Lunch on board. Sail to Kom Ombo. Afternoon Tea. Visit the Temple Shared by the Two Gods Sobek and Haroeris. Sail to Edfu. Dinner on board. Disco party. Overnight in Edfu. Breakfast on board. Cross to the West Bank to visit Valley of the Kings, the Temple of Hatshepsut and the Colossi of Memnon. Crossing the Nile, drive to the Valley of Kings; visit the tombs of various Dynasties, The Temple of Deir El Bahari. On the return journey stop at the Colossi of Memnon which are two gigantic sitting statues representing Amenopis III facing the Nile and visit the Temple of Queen Hatshepsut. Lunch on board. Afternoon free at leisure. Afternoon Tea. Overnight in Luxor. (Optional) Visit The Temple of Karnak & the Temple of Luxor. Excursion to the Luxor Temple to see its courtyard and the granite statues of Ramses the Great Proceed by carriage or bus to Karnak, which is a serious of temples built in different reigns. Starting by the Avenue of Sphinxes visit the Unfinished Propylon, the Hypostyle Hallwith it’s 134 gigantic columns, the Obelisks of Queen Hatshepsut and Tutomosis III, the temple of Amon adorned with lotus and papyrus designs, the Granite Scarbeus of Amenophis III and the Sacred Lake. Departure by an A/C car to Hurghada. Arrival and transfer to your hotel. Overnight in Hurghada. (Optional) You will be picked up from the hotel in Hurghada by Toyota land cruiser 4×4 WD, then driven 35 km in the Eastern desert of Egypt to a Bedouin village for a tour to see their life, traditions then you will ride a camel and witness the amazing sunset view with barbeque dinner, mineral water and soft drinks included, watching stars by night while driving back from Bedouin village to your hotel in Hurghada. (Optional) Our representative will pick you up from your hotel in Hurghada for a fantastic snorkeling trip with desert island relaxation on the beautiful Red Sea, where we will do our snorkeling in different spots which are full of corals and magnificent colorful fish with a chance to swim with dolphins, enjoying the water sports activities on Giftun Island and the national park with open buffet lunch aboard the cruise then return back to the jetty and then transferred to your hotel in Hurghada. Breakfast. Departure by an A/C sharing bus to Cairo. Arrival & transfer to the hotel. (Optional) Sound and light show at Pyramids. (Optional) Full day Tour Sakkara is 27-Km Southwest of Cairo. Including a visit to the step Pyramids of Sakkara (The first proper Pyramids built for the king Zoser, it is considered evolution of the Pyramid from the simple Mastaba to the Pyramid in its known form) Followed by a visit to The Pyramids of Unas & Oser-Kaf the Mastaba. Tomb of Mereruka, Ti & Pta-Hotep (carved and painted tombs), Then Memphis the ancient capital of Egypt where Colossal Statue of Ramses II and the great Alabaster Sphinx. Then visit the Old part of Cairo, as Egypt was one of the first countries to embrace Christianity. We visit the Church of Abu-Sergah and St. Berbara. The hanging Church, We will also visit the old Jewish Ben Ezra Synagogue. 3 Nights hotel accommodation in Hurghada on bed and breakfast basis. 1 Night sleeper train on Half Board basis. All transfers in Cairo, Aswan, Luxor and Hurghada. Transfer by an A/C Car: Luxor / Hurghada. Transfer by an A/C sharing Bus Hurghada / Cairo. Visa Entry for Egypt. (We can provide you with your visa upon arrival at your request). Accommodation Plan 5 stars: Le Meridien Pyramids Hotel- Nile cruises: MS Amarco, Ms Semiramis , MS World, MS Domina Prestige Emilio, MS Radamis 2, MS Nile Dolphin & MS Esadora- Mövenpick Resort. Hurghada. Accommodation Plan Luxury: Fairmont Nile City Hotel Cairo or Oberoi Mena House, Blue Shadow, MS Amwaj Nile Cruise, MS Nile Goddess, Sonesta Cruises, MS Nile Premium, MS Jaz Legacy, MS Crown Jubilee-Steigenberger Aqua Magic Red Sea - Jaz Makadi Star & Spa - Albatros Palace Resort , Hurghada.